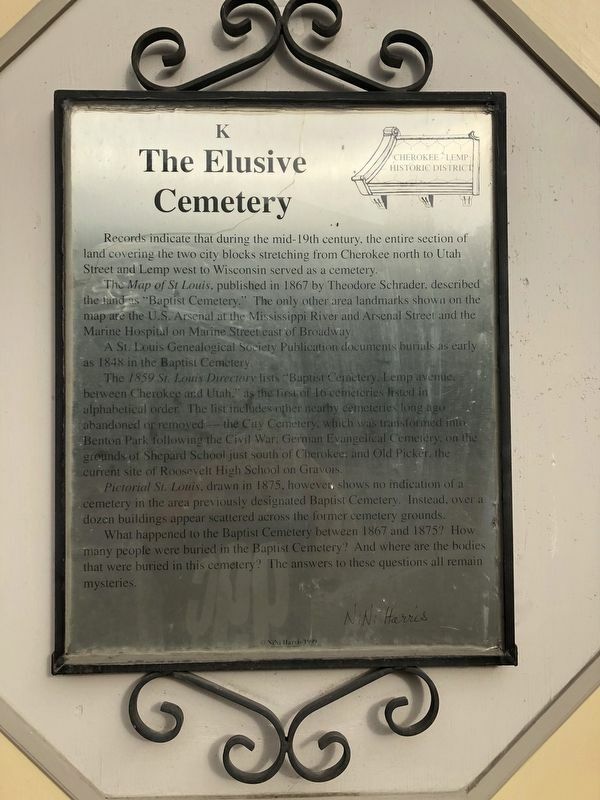 Records indicate that during the mid-19th century, the entire section of land covering the two city blocks stretching from Cherokee north to Utah Street and Lemp west to Wisconsin served as a cemetery. The Map of St. Louis, published in 1867 by Theodore Schrader, described the land as "Baptist Cemetery." The only other area landmarks shown on the map are the U.S. Arsenal at the Mississippi River and Arsenal Street and the Marine Hospital on Marine Street east of Broadway. A St. Louis Genealogical Society Publication documents burials as early as 1848 in the Baptist Cemetery. The 1859 St. Louis Directory lists "Baptist Cemetery, Lemp avenue, between Cherokee and Utah," as the first of 16 cemeteries listed in alphabetical order. The list includes other nearby cemeteries long ago abandoned or removed -- the City Cemetery, which was transformed into Benton Park following the Civil War; German Evangelical Cemetery, on the grounds of Shepard School just south of Cherokee; and Old Picker, the current site of Roosevelt High School on Gravois. no indication of a cemetery in the area previously designated Baptist Cemetery. Instead, over a dozen buildings appear scattered across the former cemetery grounds. What happened to the Baptist Cemetery between 1867 and 1875? How many people were buried in the Baptist Cemetery? And where are the bodies that were buried in this cemetery? The answers to these questions all remain mysteries. Location. 38° 35.564′ N, 90° 13.193′ W. Marker is in St. Louis, Missouri. Marker is at the intersection of Cherokee Street and Selena Street, on the right when traveling east on Cherokee Street. Touch for map. 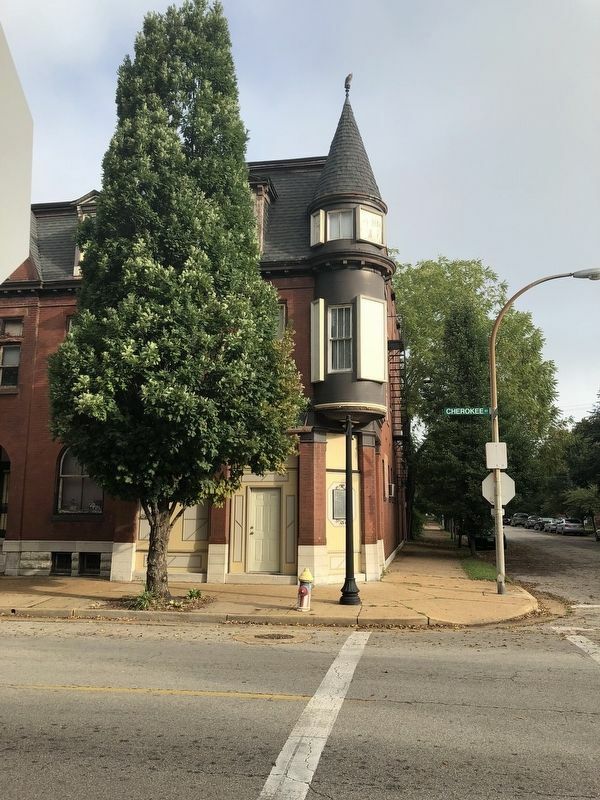 Marker is at or near this postal address: 1937 Cherokee Street, Saint Louis MO 63118, United States of America. Touch for directions. Other nearby markers. At least 8 other markers are within walking distance of this marker. Settlers' Homes (a few steps from this marker); 1959 Cherokee (about 300 feet away, measured in a direct line); 2008 Cherokee (about 400 feet away); At Home On Cherokee (about 400 feet away); 2014 Cherokee (about 500 feet away); The Cigar Store (about 800 feet away); Life In The Fifties (approx. 0.2 miles away); The Birth of Antique Row (approx. 0.2 miles away). Touch for a list and map of all markers in St. Louis. More. Search the internet for The Elusive Cemetery. Credits. This page was last revised on October 15, 2018. This page originally submitted on October 9, 2018, by Devry Becker Jones of Washington, District of Columbia. This page has been viewed 53 times since then and 11 times this year. Last updated on October 15, 2018, by Devry Becker Jones of Washington, District of Columbia. Photos: 1, 2. submitted on October 9, 2018, by Devry Becker Jones of Washington, District of Columbia. • Andrew Ruppenstein was the editor who published this page.